With the welcome re-blossoming of spring, the thoughts of those, both in the UK and in France, inevitably turn to the perennial subject of… tax! 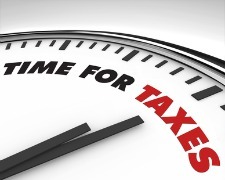 Early April in the UK sees the end of one tax year and the start of another. While in France, the end of April brings the delivery of annual household tax forms for return to the French taxman by the end of May. So it is a topical time of the year to examine the differences between the UK and French systems for assessing and calculating income tax, and revealing that, for many people making a permanent move to France, the French system can often present a pleasant surprise. By way of example, we will look at the situation of David and Susan Williams and how the same annual income for each of them is treated in the UK and France. David is aged 64, retired, and enjoys a private pension from his former employment with a UK public company of £28,000 p.a. Susan is aged 63, retired, and receives a UK state pension of £5,100 p.a., plus a private pension from former employment of £9,900 p.a. – a total of £15,000 p.a. In total therefore, the UK income tax bill for Susan and David is £6,010 and their net combined income after tax is £36,990. Now, let us to look at how the same income would be taxed if they were French resident. For illustration purposes, we will use the French tax rates and allowances applying to income received in the 2010 tax year, (1st January 2010 to 31st December 2010). We will assume an exchange rate of €1.15 to £1. The key difference with the French income tax system is that it is based on an assessment of ‘household parts’, not individual self-assessment as in the UK. In France, David and Susan, as a married couple, would be considered as two ‘parts’ for the purposes of the French calculation. In total therefore, the French income tax bill for Susan and David is €3,732 and their net income after tax is €45,718. Applying our assumed exchange rate of €1.15 to £1, then, in sterling terms, the total tax bill in France is £3,245 and their combined net income after tax is £39,755. So, in France, David and Susan would enjoy a total income tax saving of £2,765. Essentially, the household system of taxation in France provides an ‘averaging’ effect which particularly favours married couples where income is not evenly distributed between each spouse. In this case study, the ‘averaging’ effect also means that the top rate of French tax on their pension income is 14%, compared with 20% in the UK. It should be noted that income in France is also subject to social charges, which can now be as high as 13.5% on investment income. Social charges are effectively a supplementary form of income tax in France and a large part of the revenue raised is used to finance the world-leading French state healthcare system. However, because Susan already receives a UK state pension, she is entitled to an S1 form, (previously an E121) which provides free access to the French state health service paid for by the UK from her previous national insurance contributions. The S1 form will also cover David, as her dependant, until he receives his own UK state pension at age 65. As a result, both David and Susan are exempted from paying French social charges on their UK pension income. So, for couples like David and Susan, who are reasonably representative of many UK retirees considering a life across the Channel, the income tax system in France should hold no fears. Indeed, as the example figures illustrate, there can often be welcome savings to add to the attractions of an enticing French lifestyle.